2 September 2011 – Finally, it’s here!!! Can you believe it!!! The 2011-2012 Stampin’ Up! catalogue is now available!!! I can’t wait to share it with you!!! If you would like a copy of your own, please contact me. It’s only $12.95 (+ $5.95 P&H) or free if you host a workshop. 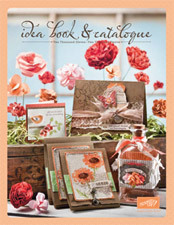 There are amazing new In-Colours, gorgeous ribbons, fabulous designer series papers, punches, big shot dies, storage (yes, big shot storage!!) and of course, lots of amazing stamp sets!!!! You can substitute any of the stamp sets, ink pads, papers and ribbons to ones of your own choosing. It’s valued at over $310 but will only cost you $169. What a bargain!!! If you would like the complete starter kit, it is also on special at 20% off, at $231.20, valued at $610. If you are interested in taking up this opportunity, please do not hestitate to contact me at stampinwithrebecca@yahoo.com.au or 0408 193 792. I have my catalogue launch on tonight which should be lots of fun!!! I’m hoping to post some pictures next week!! « 6 August 2011 – ESAD Retiring List Blog Hop! !